Fishpond Teton Rolling Carry On. A well thought out travel carry-on system that is perfectly sized for adventures in wild places. 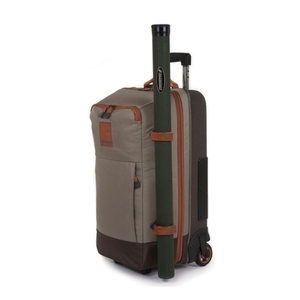 Similar to its larger counterpart, the Teton Rolling Carry-On was designed for the user to roll through the airport with a passport, a change of clothes, all essential fishing gear, and a fly rod strapped to the side. Constructed from 420d recycled Cyclepond nylon and overhead bin compatible.